Some people do jigsaw puzzles during their holiday breaks. This year you can help solve a different kind of puzzle by mapping a single neuron's path through a mouse's retina—right from the comfort of your couch. MIT neuroscientist Sebastian Seung has a deceptively simple question he wants his lab to answer: does the wiring of neurons in a particular person's brain (also called a 'connectome') determine the basis of who that person is? An easy question to ask, but a difficult one to answer. The first step is to map out the "wires" extending from a single neuron, called "projections"—a task that has been all but impossible until recently. Technological advancements have finally placed such a project in the realm of possibility. Computer programs can help with the collection of data (in this case, stacks of electron microscope images of a mouse retina) and some of the analysis. These programs run into problems, however, when dealing with something as complicated as tightly packed neurons. 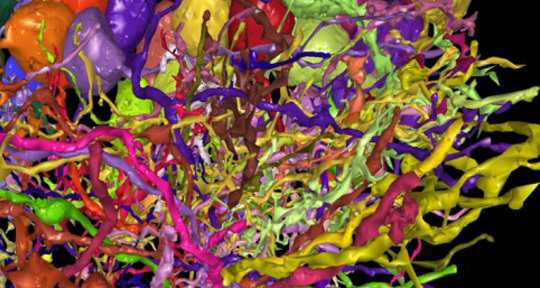 A computer can start to map the projections that come out of a particular neuron but faces a problem when projections from one neuron cross projections from other neurons. That's where citizen scientists come into the picture—along with Seung's new project, a game called EyeWire. EyeWire officially launched on December 10th with an ambitious goal: to create a 3D map of all the projections from a particular type of retinal cell called a J Cell in order to better understand the role this cell plays in vision. J Cells have a giant array of projections and are quite beautiful (see images here). On the day EyeWire officially launched, more than 10,000 people played and by doing so participated in mapping the complicated projections of a J Cell. At the end of the day, they were almost a third of the way to mapping the estimated total projections of the cell (you can see the progress here). According to the EyeWire website, this was much faster than expected! Want to help the Seung lab with their quest and have some fun in the process? You can help out by playing EyeWire for just 10 minutes.